Provide comfort for the family of Glenn Copeland with a meaningful gesture of sympathy. Glenn Everett Copeland, 91, was called to his Heavenly Home on Dec 21, 2018. He was born Nov. 30, 1927 in Mansfield, AR to Raymon Fenton & Bessie Jewel (Slate) Copeland. Glenn was dedicated to his family & was a great husband & father. Glenn was a Boy Scout, and played for the Mansfield High School football team, where he made a 55 yd touchdown. He graduated from Mansfield HS in 1947. In 1948 he enlisted in the Army in Denver, CO, did basic training at Ft. Ord in Monterey, CA, then was stationed at Governor Island, NY; Adak, AK; & Kilmer, NJ. In 1950 he met his wife Mae. They were married May 14, 1952, and in April 1952 they had their first baby. 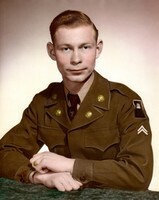 Glenn was discharged from the Army after serving in the Korean Conflict in May 1952. He went to work for LE Myers Electric Co. in 1952 in AR. They moved to Wichita, KS where he worked for Boeing from 1954-1961. They then moved to OKC & he worked in fuel tanks division at Tinker from 1961-1987. He was a neighborhood VP, and he also was the treasurer at Woodson Park Church of the Nazarene from 1984-2013. In 1989 the church had a Glenn Copeland Appreciation Day. In 2000 he was diagnosed with cancer, but God had more plans for him. He was awarded the State of Oklahoma Citation Upstanding Well Respected Citizen in 2012. Glenn & Mae lived in their home for 52 years before moving to assisted living in August 2013, where he was awarded Resident of the Month by Meadow Lakes Retirement Village. He played basketball, football, & pool. He enjoyed whittling miniature wooden shoes, football helmets, baseball gloves, cowboy hats, & walking canes. He loved music & singing at the church. In April 2018, he went to Washington DC to participate in an honorary flight for veterans. The family would like to thank Physicians Choice for being there for Glenn & Meadow Lakes Retirement Village for their care. and many nieces, nephews, & friends. To send flowers in memory of Glenn Everett Copeland, please visit our Heartfelt Sympathies Store. Provide comfort for the family of Glenn Everett Copeland by sending flowers.